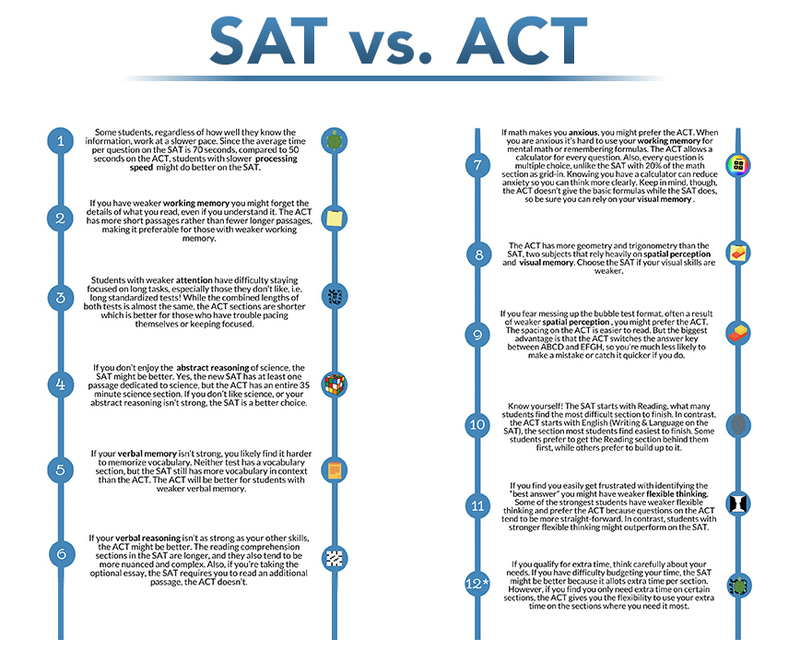 ACT vs SAT: Which test is best? In MN, the facts speak for themselves. CLICK HERE to learn all you can about both tests and find out which test is best! The ACT, typically taken by high school juniors and seniors, measures student achievement in 4 subject areas including English, math, reading, and science plus writing. The ACT is accepted by all colleges and universities in the United States. The ACT is offered 6 times a year and students should plan to take the test at least two to three times as scores will continue to improve past the first test administration. Colleges typically don’t like to see students take this test more than three times in order to attain their score goal. Exact test dates are available for viewing on the ACT website, or by clicking here. Students are encouraged to register for the ACT test at least 8 weeks in advance. Students register for the ACT by going to the ACT Website to create a login and password and to pick a preferred testing venue or by clicking here. ACT test preparation should begin between two and half to three months prior to the first test date. On average, a student should plan on 24-30 hours of preparation. The ACT is comprised of 4 multiple-choice sections plus a 5th optional writing test or essay. The four subjects include English, math, reading and science. We recommend that the essay or optional writing test is taken by all students. Our focus is to help our students achieve their personal best by teaching a combination of content as well as strategies designed to master the test. Below find an overview of each of the four subjects covered. The ACT English section contains 75 multiple choice questions which students must complete within 45 minutes. This grammar section of the ACT covers Usage/Mechanics and Rhetorical Skills which many students find challenging. Grammar is not typically taught in the upper grades in high school so our programs focus on teaching students the grammar they need to do well on this section and for college and beyond. The ACT math section contains 60 questions to be completed in 60 minutes. The questions cover Pre-Algebra, Algebra I, Algebra II, Coordinate and Plane Geometry as well as Trigonometry. Approved calculators are allowed to be used during the ACT test. The challenge with ACT math is the fast pace with which questions need to be completed. The ACT reading test has 40 questions to be completed within 35 minutes. These questions measure reading comprehension skills. The passages cover a wide range of topics, and are meant to reflect the level of reading required during a student’s first year in a college or university level course. The ACT science test includes 40 questions to be answered within 35 minutes. This portion of the ACT is designed to measure skills including but not limited to: analysis, evaluation, interpretation, problem solving, and reading. The ACT science test is designed with the assumption that students will have completed at least three years of high school science classes. Graphs, tables, and summaries detailing scientific information are provided in this section which measures an understanding of critical analysis and conclusions. The writing test portion of the ACT is technically optional. However, we strongly suggest that all students take the essay. In the 40 minute test, an issue will be defined, with three differing sides of the issue provided. Students must take a position on each of the three perspectives and cogently present their opinions with solid reasoning and support for each perspective. The writing test portion of the ACT does not affect the student’s overall composite score on the ACT. Each section of the ACT is scored on a scale of 1-36, with the composite score being an average of each of the 4 sections of the test. The essay is scored from 2-12 by two readers but the score is not included as part of the composite. In years past there was only one PSAT (Preliminary SAT) given to high school students in 9th, 10th or 11th grade. Today, there are three different tests that students can take. · The old PSAT has been redesigned and is now the PSAT/NMSQT, which is administered to sophomores and juniors in October. It is the qualifying test for National Merit Scholarship recognition for those 11th graders who score high. · The PSAT 10 is a practice test which is administered in the spring to 10th graders. The PSAT differs from the SAT in that it is a shorter test and there is no essay component. The PSAT takes less than 3 hours to complete. If your student intends to take the PSAT/NMSQT in 11th grade, we advise that preparation begins in August or September. We offer one-on-one personalized tutoring for advanced students who want to earn top scores. We also provide a PSAT Mini-Review class (10 hours) designed to give all students a strong orientation to the test including content and strategies without investing in a full 25 hour class. The SAT is used by colleges and universities as part of their admission requirements. It is also used to determine scholarship eligibility. The SAT is designed to measure a student’s reading, writing and math reasoning skills. The new SAT became available with the March 2016 administration. Students are allowed either 3 hours or 3 hours and 50 minutes to take the new SAT. For students who do not take the essay portion of the new SAT, the exam lasts 3 hours. If students are taking the essay (which was required in the older SAT, but is now optional), the exam lasts 3 hours and 50 minutes. The SAT reading and writing segments take 100 minutes in contrast to the current SAT which lasts 130 minutes. The new SAT continues to focus on reasoning skills but also tests the meaning of words in a larger context and addresses how word choices affect meaning, impact and tone. To do well on the new SAT, students must have strong reading comprehension skills as well as a firm grasp of grammar and math. The SAT has just two math segments with one 55 minute segment permitting the use of approved calculators, and the other 25 minute segment prohibiting the use of a calculator. The new SAT math section presents more problems which require multiple steps and tests problem solving and data analysis. This is in contrast to the current SAT where more math problems are traditionally solved in a single step. The new SAT focuses on essential areas of math knowledge: problem solving/data analysis, algebra and advanced math. For more information about the redesigned SAT, click here. The new SAT is scored on only 2 sections (evidence-based reading and writing, and math). The optional essay in the redesigned SAT also has a separate score. The new SAT does NOT penalize for incorrect answers. The maximum score possible on the new SAT is 1600 with each of the two sections scored 200-800. The SAT is administered multiple times each year. The majority of students will take the SAT during their junior year at least twice, reserving a third administration for early in senior year. SAT test dates can be found by clicking here. We advise students to register for the SAT at least 8 weeks in advance. Students may register for the SAT by visiting https://sat.collegeboard.org/register/. Each test date has its own registration deadline and choice of venues for the test.